Aikenhead's PharmaChoice Drug Store | Aikenheads Pharmacy, PharmaChoice in Downtown Renfrew! Your One Stop Shop! Welcome to Aikenhead's PharmaChoice Drug Store in Downtown Renfrew! "Your One Stop Shop"
Aikenhead's PharmaChoice Drug Store in Downtown Renfrew has been locally owned and operated since 1938 and offers you a complete range of products and services, to meet your needs. Your Aikenhead's PharmaChoice pharmacy offers many of your favourite items on sale every week. Please check back regularly and visit the pharmacy for new offers in-store. New to Aikenhead's PharmaChoice! Order refills of your prescriptions without leaving home! E-Scripts allow you to order refills online from any device! Going on holidays? Come into Aikenhead's PharmaChoice before you depart and get all the necessary vaccinations. Enjoy peace of mind on your vacation knowing you are protected. Aikenhead's is now an official Canada Post location. New - There's an App for That! Order refills of your prescriptions without leaving home! 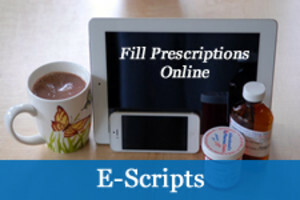 E-scripts allow you order refills online from any device!